An old recording logo showed a dog listening at a megaphone-type speaker with the words, "His Master's Voice. 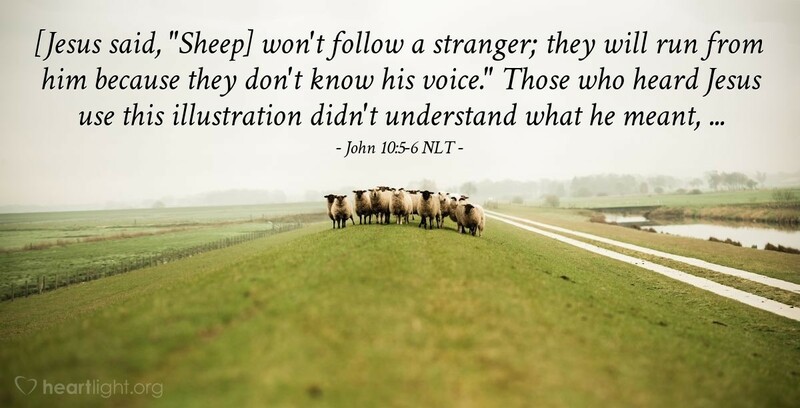 "® In the same way, we — as the sheep in today's verses — should know the voice of the true shepherd. We should train ourselves to recognize him and so trust him because of his love for us that we will not follow anyone who does not sound like our shepherd. Jesus is our shepherd. He speaks, and we hear the Master's voice. We follow him as Lord, and him alone. O God, give me a heart to follow Jesus alone and an ear to recognize any impostor that might seek to steal away my heart from my Lord. In Jesus' name, I pray. Amen.